Over 30,000 people took pole position to enjoy the fabulous Ormskirk MotorFest as the annual extravaganza attracted massive crowds. MotorFest is one of the biggest free family days out in the North West and people of all ages enjoyed the event. Between 270 and 300 marvellous cars and motorcycles covering over a century of motoring and automotive heritage and history were on display in Ormskirk town centre and Coronation Park. Star cars of the show included the wonderful Vanwall VW5/11, the first British-made car to win the British Grand Prix by British drivers when it was driven to victory by Tony Brooks and Stirling Moss in the 1957 British/European Grand Prix at the Aintree Circuit. The Formula 1 theme continued with a classic BRM car, which was raced by Graham Hill at Aintree in its last Formula 1 race in 1964, also attracted a lot of attention, as did the Jaguar Project 7 car. This is the modern day equivalent of the D-type Jaguar and the name acknowledges Jaguar’s seven victories at Le Mans between 1951 and 1990. Although not intended for production, Project 7 is not merely a static concept, but a fully-functional, high-performance sports car. There was also a 1951 Jaguar XK120 which had been driven with distinction by leading female racing drivers of the 1950s Betty Haig and Lorna Doone-Snow, and a superb range of other cars and motorcycles including Ferraris, Porsches and even bubble cars. Many of the cars took part in parade laps which former Top Gear presenter Steve Berry and legendary motor racing commentator Neville Hay commentated on to keep the crowds informed about the wonderful cars going around the town centre. Steve and Neville also used their expertise as judges in the Concours d’Elegance competition, which saw some of the best presented cars competing for prizes in individual classes. 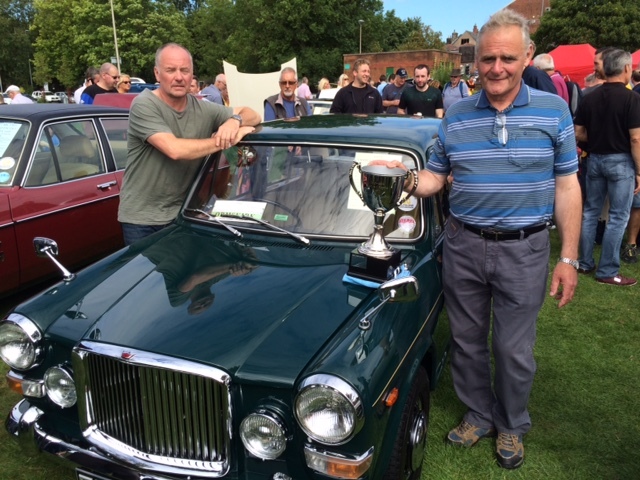 The overall winner was George Cross with his 1972 Vanden Plas Princess Mk Two. Ormskirk MotorFest is a free event organised by Aintree Circuit Club and supported by West Lancashire Borough Council. Councillor John Hodson, portfolio holder for Planning, said: “The marvellous MotorFest was a wonderful day out for all the family and I was really pleased to see so many people in Ormskirk enjoying themselves. I hope that the businesses that opened up for the occasion all had a good day as well. The crowds also enjoyed the Speciality Vintage and Makers Market which featured a great selection of stalls selling art and crafts, retro, vintage and up-cycled wares and there was also music, games and children’s activities including face painting. A Charlie Chaplin walkabout entertained with his cheeky antics and the Vintage DJs had people’s feet tapping to charming sounds of a bygone era. Music was also provided by Merchant Taylor School’s Saxophone Group. Mike Ashcroft, Aintree Circuit Club chairman, said: “I am delighted we were able to bring such a marvellous event to the streets of Ormskirk once again and that another huge crowd enjoyed the event. There were some wonderful vehicles on display and the Speciality Vintage and Makers Market was a great added attraction for people to enjoy. “We are very grateful to West Lancashire Borough Council and the police for their support and to all our sponsors and volunteer marshals. We would also like thank the medical staff and volunteers who gave us great support on the day. 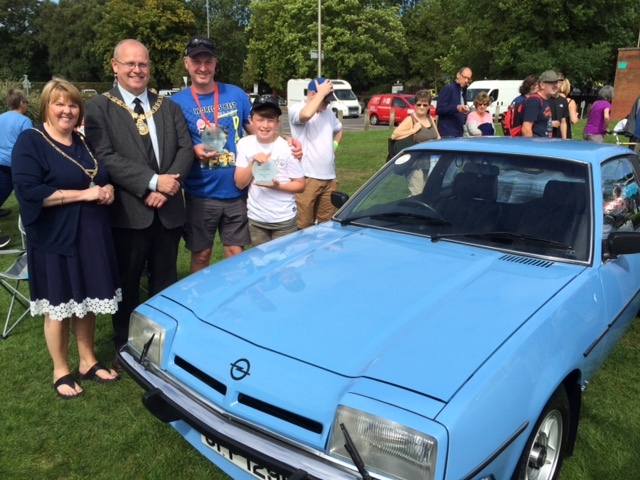 The Mayor’s Choice Award winner for best car was Stuart Kelly’s 1977 Opel Manta SR Coupe and the Mayor’s Choice Award winner for best motorcycle was a Yamaha. There is lots more happening in and around Ormskirk – to find out more visit the great new website www.discoverormskirk.com. You can also find Discover Ormskirk on Facebook at www.facebook.com/DiscoverOrmskirk.